Stay tuned for upcoming events for Lahore Football League in near future. Lahore Football League is a competition between top Universities of Lahore. Lahore Football League 2017 will be organized by Ali Marketing in collaboration with Jung Media Group in April 2017. 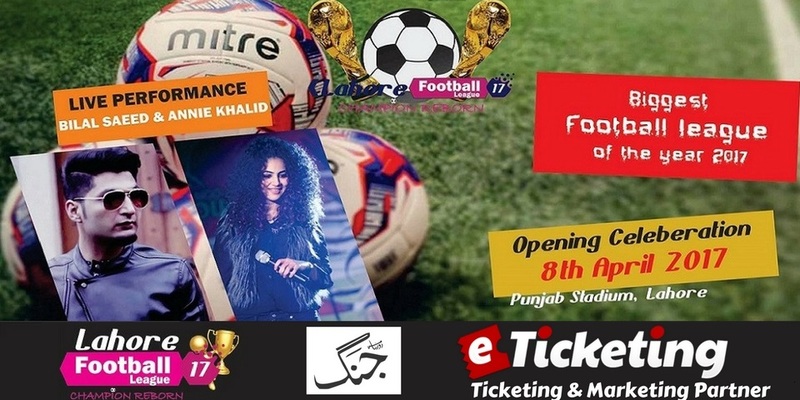 Opening celebrations will feature Live Concert of Bilal Saeed and Annie Khalid on 8 April 2017. Soccer fans get on the game. Music lovers enjoy melodious gig. Terms & Conditions : All rights reserved. Best Viewed at 1024 x 768 pixels and above. This Page loaded in 0.08582 seconds on Tue, Apr 23, 2019 (21:39).